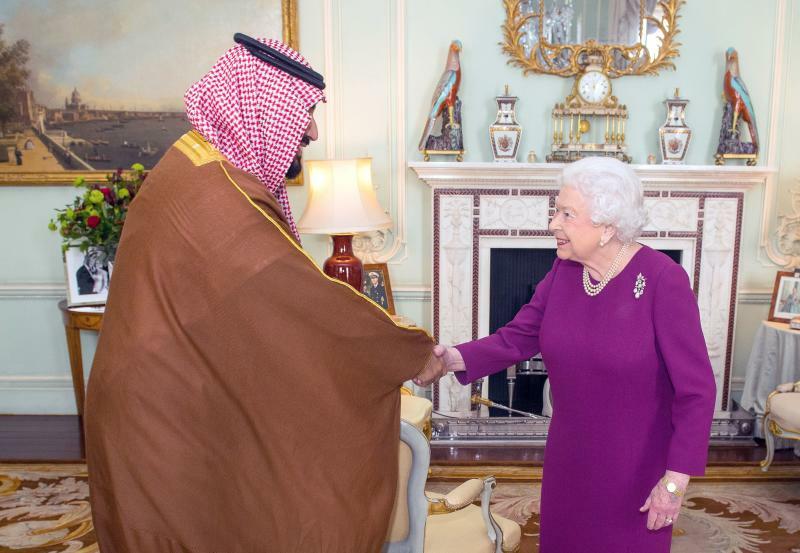 As part of a tour of Western countries to promote the changes he's making in Saudi Arabia, Crown Prince Mohammed bin Salman visited the United Kingdom, where he met with Queen Elizabeth, March 7, 2018. Saudi Arabia’s crown prince, Mohammed bin Salman, says women and men are “absolutely” equal, even though he leads a country with some of the world’s strictest laws againstwomen’s rights. “We are all human beings and there is no difference,” he told CBS’ “60 Minutes” in aninterviewthat aired Sunday. Bin Salman ascended to the role of crown prince in June, and began a fast-paced and at times controversial cultural and political overhaul. At the top of the list, he said, was doing away with policies that have prevented women from flourishing since Saudis imposed strict religious rule in 1979. Starting in June, women willlegally be allowed to drivein Saudi Arabia. Women can now watchsports games and go to the movies,join the military and areno longer required to wear a black abaya― the robe that covers a woman’s body from head to toe ― in public. The government is working on an equal pay initiative, he added. Interviewer Norah O’Donnell pressed bin Salman on rights women are still denied, including the country’sguardianship laws that require women to ask permission from a male guardian to do things like apply for a passport or get married. Women also can’t eat in restaurantsexcept in a designated family sectionorreceive equal rights in court. He acknowledged there’s more to be done. Bin Salman is on a tour of Western countries to promote his country and court investors. After visiting the U.K. last week, he willspend two weeksmeeting political and business heads in Washington, New York and Silicon Valley.